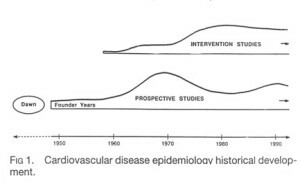 These systematic summaries cover the early epidemiological studies and prevention trials, begun mainly before the mid-1970s. Submissions are welcome of other relevant study descriptions from that early period, along with additions or corrections to existing summaries. References to the defining publication of each of these early studies are found in table form by clicking here. Anti-Coronary Club Trial 1957 Christakis, G.
Bierenbaum St. Vincent’s Hospital Study 1959 Bierenbaum, M.L. Finnish Mental Hospital Trial 1959 - 1971 Turpeinen, O.
Morrison Diet-Heart Study 1946 Morrison, Lester	M.
Multifactorial CVD Prevention Trial in Helsinki Businessmen 1964 Standberg, T.E. Stockholm Prevention Trial with Clofibrate and Niacin 1972 Carlson, L.A.
United Airlines Study 1966 Krasno, L.R. Wadsworth Veterans Administration Domiciliary Hospital Study 1959 Dayton, S.